NASA and Congress: We must get politics out of NASA. At least it’s not a snowball. When Sen. Ted Cruz, R-Texas, was made head of the Senate committee in charge of NASA’s funding, I (and many others) were appalled. Cruz is a science denier, flatly claiming global warming isn’t happening. This is an issue, since many of NASA’s missions are directly focused on examining the amount, extent, and impact of that warming. And rightly so. While Cruz may not be able to directly impact NASA’s budget, he can certainly make things difficult on the agency and pressure others to change NASA’s emphasis. He made this very clear last week when he held a meeting with NASA’s Administrator Charles Bolden as a witness. Cruz opened the session asking Bolden about NASA’s core mission, a clear shot at the idea that they should be looking outwards, not down. Throughout the session, Cruz downplayed Earth science, claiming that NASA has lost focus on exploring space. It’s clear everything he was saying came from his stance of global warming denial. And that is utter nonsense, to be incredibly polite. Pure and simple. Bolden shot back, saying, “We can’t go anywhere if the Kennedy Space Center goes underwater and we don’t know it—and that’s understanding our environment.” In other words, we must study the Earth and its changing climate. Studying our planet is at least as important as studying others. Second, as Bolden also points out, NASA has been gearing up for doing more human exploration for some time now. * While I am not a fan of the Space Launch System rocket, it will certainly be able to lift a lot of payload into orbit and beyond (though at huge expense). And SpaceX is working on the Falcon Heavy, which will launch well before SLS gets off the ground and will also be capable of heavy lifting. Its first demo launch will be in just a few months. Over the years, NASA has had to beg and scrape to get the relatively small amount of money it gets—less than half a percent of the national budget—and still manages to do great things with it. 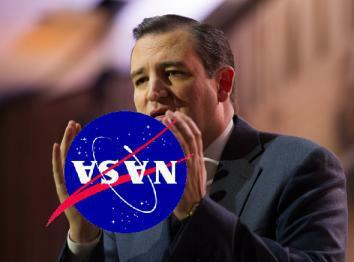 Cruz is worried NASA’s focus needs to be more on space exploration. Fine. Then give them enough money to do everything in their charter: Explore space, send humans there, and study our planet. Whether you think climate change is real or not—and it is— telling NASA they should turn a blind eye to the environment of our own planet is insanity. Bear in mind, too, Cruz has his sights set on the White House. That’s where NASA’s budget starts. Under a Cruz administration, NASA’s Earth Sciences program would be screwed. There’s more. A few days before Cruz held his session, the House Subcommittee for Commerce, Justice, Science, and Related Agencies (which has NASA in its jurisdiction) also held a meeting with Bolden as a witness. The chairman, John Culberson, R-Texas, is a friend of NASA; he was the one who fought for more money in NASA’s budget for a mission to Europa. But even he holds some mistaken ideas about the agency. Right now, we depend on the Russians for access to the International Space Station, and given Russia’s current volatility (to say the least), Culberson asked Bolden what contingency plans NASA has if Russia decides to pull out. Culberson: Had NASA not canceled the Constellation program we’d be ready to fly within 12 months. Bolden: Mr. Chairman that is not correct … whoever told you that, that is not correct. Hearing Culberson say that makes me grind my teeth. The Constellation rocket system was way behind schedule and well over budget, and that’s why President Obama canceled it, correctly in my opinion. If we had kept it going I’d bet we still wouldn’t be able to put people into space today. At least not without huge impact to NASA’s other capabilities, due to its fixed budget. And Bolden is right. Over the years, the president’s NASA budget request for commercial flight has been slashed by Congress over and again (in FY 2012 it was cut by more than 50 percent). If that money had instead gotten to NASA, we might very well already be celebrating the launch of Americans into space by an American rocket. Instead, here we are, dependent on the Russians. Watching Congress grill NASA over what is Congress’ fault is frustrating to say the least. I have issues with the president’s requests for NASA as well, and I’ve been vocal about them. But on the balance, it’s been Congress that has been slowly squeezing the life out of NASA’s ability to return to human spaceflight. And the shenanigans there still continue, since there has been a lot of political tomfoolery involving SLS, especially when it comes to SpaceX. I suggest Culberson talk to his colleagues about that before complaining to NASA that they can’t do what they’ve been mandated to do. Look. NASA is the world’s premier space agency. Yes, I am an American, and yes, I say that with pride. Certainly, the European Space Agency is doing fantastic things and will continue to do so, but NASA has done more, gone farther, and been more a source of inspiration than any other. But the politics of funding a government agency is tying NASA in knots and critically endangering its ability to explore. At one point in his meeting, Culberson said, “Everything NASA does is just pure good.” That’s a nice sentiment. It would even better if Congress and the White House would let them do it. *Planetary missions are in trouble, though. My thanks to NASA press secretary Lauren Worley for the budget numbers pertaining to commercial space flight.